This still life is a superb example of the genre that achieved independence—and also gained enormous popularity—in the seventeenth century. The canvas here is, in itself, a compendium of Kalf’s work, bringing together the most outstanding elements of his style. The sumptuous objects depicted—the Chinese Ming bowl, the wine glass with its filigree glass cover and the Persian carpet—appeared in many of his paintings. Further, light is characteristically used to enhance the play of glints and reflections cast by the objects. This canvas, one of the few that Kalf signed and dated, provides a valuable reference for the construction of a chronology of his paintings. Willem Kalf settled in Amsterdam in 1653 following his return from Paris in 1646 and a period in Rotterdam and Hoorn in 1651, having married in the latter city. The three still lifes in the Collection date from his Amsterdam period during which Kalf abandoned the use of large formats typical of his rich and complex Paris compositions and presented his compositions on a smaller scale and with fewer objects. On occasions he used settings that included barely visible niches in the background, against which he set fruit and objects illuminated with a soft, graduated light falling from one side. The objects are set on a table with a marble top and are arranged upright with only the occasional use of an oblique line for a plate or piece of fruit. 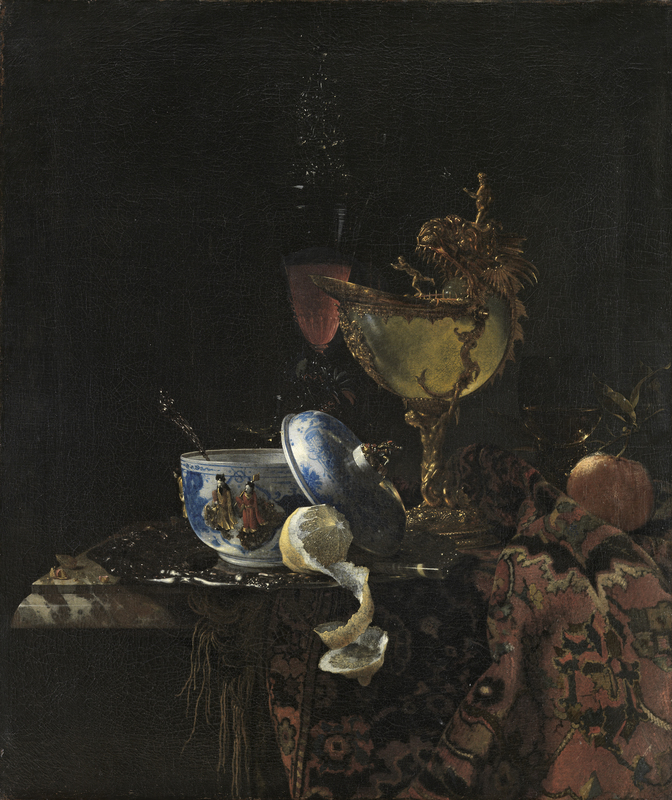 In these compositions Kalf generally included tall, elegant glasses in the backgrounds, using them to create compositional lines that run through the still life and connect with the foregrounds. These foregrounds often contain a lemon, a distinctive and characteristic element in many of these compositions. Kalf used materials such as glass in the wine vessels and metal in the form of trays, as well as distinctive items such as the mounted, lidded Chinese bowl seen here. The fruit and smaller objects such as watches, nutshells, peach stones and grape pips are generally presented slightly separated from the principal motif on one corner of the table. This canvas was auctioned in Amsterdam in 1778 and was thought to have previously belonged to Pieter van den Bogaerde. It was later in the collection of Count Alexis Orlov-Denisov in St. Petersburg, while in 1911 it was in the collection of Michel van Gelder at the château de Zeecrabbe near Brussels. In 1938 it is documented in the Ten Cate collection, to where it was returned after World War II. In 1962 it was acquired via a bank from the Ten Cate estate by Hans Heinrich Thyssen-Bornemisza for his collection at the Villa Favorita. The canvas is signed and dated 1662 and is one of the few dated works by Kalf, thus serving as a reference point for establishing the chronology of his oeuvre. The composition is organised using only a few objects but ones of great aesthetic merit and value. Some of them would have belonged to collectors who loaned them to the artist so that he could depict them in his paintings. Among these unusual pieces are a late Ming bowl decorated with reliefs of the eight Taoist immortals. Described in some publications as a sugar bowl, it has also been thought to be a punch bowl. The wine glass with its delicate cover is a copy of a Venetian model made in Holland. Like the sugar bowl, the Herat rug with large floral motifs and the nautilus shell with its silver-gilt mounts are objects found in other still lifes by Kalf, although always depicted with small variations. The light used by the artist is soft and graduated, enveloping the objects while also revealing them to the viewer. Kalf paid great attention to the highlights and interplay of reflections between the objects, achieving a precise analysis of light and the effects of colour. Some of his still lifes, including this example, may contain a hidden meaning that is now difficult to discern. The inclusion of sweet citrus fruits such as oranges and bitter ones such as lemon may refer, in combination with the wine, to temperance and moderation. The canvas has been compared to another by Kalf in the Berlin Gemäldegalerie, also dated 1662, in which the artist again included the chased silver tray, the rug and the Chinese bowl. The latter is, however, seen from a different angle with its lid in a different position and with different decoration on the finial of the lid. Among the costly objects that Kalf used in this work, the most striking is the nautilus shell mounted in silver-gilt. This decorative cup of great value and delicate ornamentation is supported by an Atlas figure, while at the top is a sea monster on whose head stands a figure that can be identified as Neptune from its trident. The sea monster opens its mouth to swallow a tiny figure that has been identified as Ulysses or as Jonah. According to Roodenburg, this type of object was produced in the Utrecht workshop of the goldsmith Jan Jacob van Royenstein in the late 16th century. Two copies of this painting are known: one belongs to the heirs of the Thyssen-Bornemisza family and the other is in the Göteborgs Konstmuseum in Gothenburg.